Find out about the best things to do in Nanning. The list below is a number of the best Nanning attractions & things to do in Nanning - to find out more about each attraction, click on the corresponding link. ​Interested in enjoying yourself in a quiet environment with lush and green plants and colorful flowers in Nanning? Qingxiu Mountain is a famous local park offering visitors and locals alike a variety of gardens and entertainment facilities to enjoy in Nanning. 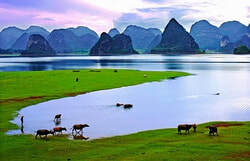 ​Are you interested in learning the history and culture of Guangxi Province? The best place to start is by visiting Guangxi Museum which offers a variety of antique collections including minority antiques, ceramics, tea culture and more! ​Located in the central downtown area of Nanning City, South Lake Park offers a flush green park with quiet surrounding in the center of Nanning. The park has no corresponding entrance fee and is a popular place for locals to relax in the middle of the city. ​Situated only 18 kms from Nanning City, the Yiling Cave is a famous karst cave, locally known as “the Underground Palace”. The cave features stalactites, stalagmites, stone flowers and stone pillars with different shapes. ​With a history of over 1,000 years, Yangmei Ancient Town has the best-preserved old buildings from the Ming and Qing dynasties. Within the town, there are over 700 buildings of that kind, including residents, docks and estates are dotted around Yangmei Town. ​As a settlement for ethnic minorities, Bama Longevity Village enjoys a good reputation around the world. With the unique natural environment, exceptional air and one-of-a-kind spring water, it has raised countless the most centurions within an area, worldwide. ​As the largest cross-border waterfalls in Asia and the 4th largest cross-border waterfalls in the world, the Detian Waterfalls offers an amazing landscape. It shows stunning kinds of scenery in various weather and seasons. 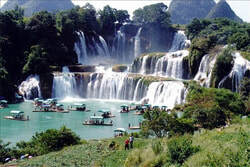 ​Situated 29 kms from the Detian Waterfalls, Tongling Grand Canyon offers waterfalls in caves, underground rivers, old trees, ancient hanging coffins, streams and primeval vegetation. It is also home to more than 2,000 types of plants. ​Located 28 kilometers northwest of Jingxi, Quyang Lake is ideal for photographing the stunning sunset. This is a man-made reservoir with incredible scenery featuring tens of peaks standing in the lake, this attraction offers a unique view to appreciate. ​Baimo Cave is located 30 kilometers from Bama Town and is considered to be one of the main highlight in Bama. The karst cave offers four different 'palaces' (caverns) as well as several sinkholes on which stands cliffs and tens of stone pillars with heights of up to 80 meters!